The last part of Isaiah 61:3 says this, " They will be called oaks of righteousness, a planting of the LORD for the display of his splendor." Here is a close up of one of the Oaks. The tree trunks where made out of Chocolate fondant that I shaped into tree form then drew the design on. The tops where also made out of fondant, then added tip 352 leaves in buttercream. Here is the cake "mostly" finished. The finished cake had the name of their four boys, one on each tree on the bottom cake, and a question mark on the top tree. Janice this is utterly amazing... What a cool design and you are so very talented. How fun that the CB embossing folder can be used for more than just papercrafting, lol! Can I just say I don't even know this couple...but thrilled that they are having a girl :o) What a treasured verse for them to claim as they train these children for Him! Janice this is amazing!! My daughter and I were both very impressed with it - and as Jennie said, we don't know this couple but were pleased for them expecting the blessing of a baby girl!! WOW!!! You are so talented! 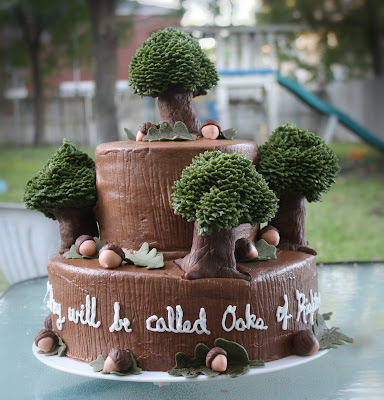 This is such a special cake...Your trees are fantastic! Janice this is totally amazing and THEN some!!! I used to decorate cakes but NOTHING like this!!! What a wonderful verse for this family to use and I am so happy the icing is pink!!! I'm sure they are thrilled and will never ever forget all you put into this cake! So cool that you used a CB folder for the pattern on the sides!!! Wow!!! When I pick my jaw up off the floor I might have more to say!!! God has certainly blessed you with incredible talent in multiple ways my friend!!! Wwwoooaaahhh! Incredible, Janice!! Where did you learn and study these skills? Probably in your own kitchen LOL! ...God has blessed you with many talents, my friend! !I'm sure it's as delicious as it looks. And congratulations to the family who finally have a girl after (what 4?) boys. She'll be the icing on the cake! WOW!!! This is spectacular Janice. If it is ok with you, I will show one of your photo's this week with my fall projects and then link to your blog for the details. More people should see and read this post!